It's annoying to pester people about a book they must read. 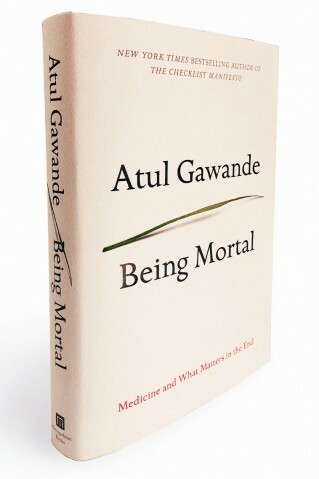 Being Mortal: Medicine and What Matters in the End, by Atul Gawande. It's not a charmer. There's no romance or inspiration. Poor health and near death are tough sellers. But this book is true, necessary. It will stir and shift the way you think about serious illness and approaching death. Atul Gawande is a surgeon, a writer for The New Yorker, and an engaging storyteller. Being Mortal charts his personal experience while also calling for a change in our culture's philosophy of health care. What is your understanding of the situation and its potential outcomes? And what is the course of action that best serves this understanding?" Who should read this book? Caregivers, children with aging parents, people with serious illness, people who are friends of the ill and/or aging, family members of the ill and/or aging, people who are aging, Well, so, I guess that's everyone. Buy this book. Borrow this book (libraries have it!). And for the time-pressed, watch PBS's Frontline feature on this book.